I recently had a client pose an interesting question related to their shopping cart. They wanted to know the distribution of money its visitors were bringing with them to each step of the shopping cart funnel. For example, what percent of visitors have between $25 and $50 in their cart when they reach the “Billing” step of the conversion funnel? 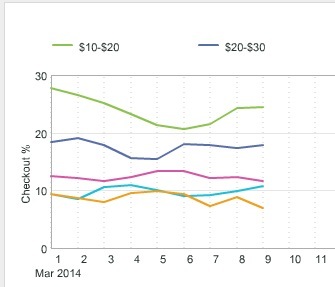 Does this percentage remain constant throughout the funnel or are there significant drop-offs? Unfortunately, this is not something that can be easily derived in SiteCatalyst, but with a bit of creativity, I will show you how you can add this data to your implementation. The first step in this process is to work with your developers to create a new Counter eVar that will hold the current order value. As soon as a visitor adds an item to the cart, pass the dollar amount associated with that cart addition to the Counter eVar (in addition to passing it to a currency event as prescribed in my “Money Left On Table” blog post). This value will be bound to the Cart Addition success event and future cart events unless it is modified. If the visitor adds more products to the cart, pass in those amounts and if the visitor removes an item from the cart, subtract it from the Counter eVar value (remember you pass values to Counter eVars using the “+” or “-” sign). I would expire the Counter eVar at the Purchase or Visit (if your site doesn’t have a persistent cart). This general concept is similar to one that I described in my Revenue Bands post, but in that scenario, we were just passing the final order amount to a regular text eVar. The difference here is that we are using the Counter eVar to adjust the order value up or down as it progresses through the cart process. 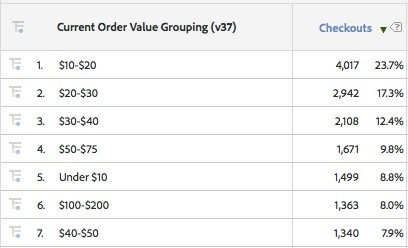 Once we have the current order values tied to each stage of the cart funnel and have grouped them accordingly using SAINT, our next challenge is to compare the distributions. There are a few different comparisons you can make with this data, so I will touch upon each of them. The first one you might want to see is whether the various percent distributions are steady or going up/down over time. In this case, you may not care about the actual raw numbers that are associated with each order value range, but rather, are most likely more interested in the percent of the total. For example, it may not be that interesting that 2,500 checkouts fell into the range of $15-$25, but it may be interesting to know that this dollar range represented 15% of all visits to the checkout step of the funnel. If you could see this percentage, then you could trend it over time and see if that $15-$25 bucket is increasing, decreasing or steady over time. This allows you to see how each dollar amount band does and do some hard-core web analysis! 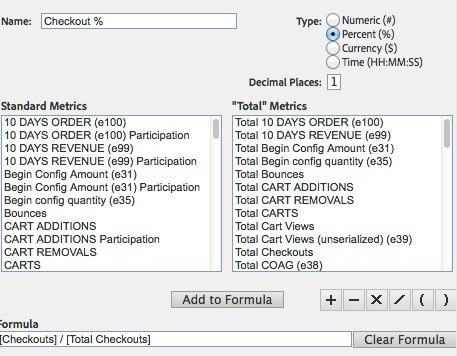 Another analysis you may want to do with this data is to see the drop-off between the dollars amount percentages added to cart, the percentages making it to checkout, etc… This is a bit more complex because you are looking at one dollar amount grouping, but seeing how it changes as visitors get further in the cart process. Unfortunately, there is no great SiteCatalyst report for comparing different percentages over time, so this analysis will have to be done in Excel. In this case, we are looking to see how consistent the percentages are across each row and seeing if we can identify any problem areas. However, to do analysis on this, Excel might be a better tool since it is easier to compare the percentages between different columns. Also keep in mind that you can break this report down by Product or Product Category to see how these percentages change by Product. If your website has discrete steps in its funnel and if you are curious to see how much money visitors have at each step of the cart, the preceding is one way to do this. In addition to what I have shown here, having this information can be useful in other ways. For example, if you want to build a segment of all cases in which a visitor had more than $100 at the checkout step, but did not purchase, the eVar described here can be used as part of your segment criteria. I am sure there are many other ways to use this data as well, but hopefully this gives you some food for thought.